The Hizir is the largest mine-resistant vehicle in Katmerciler‘s product line and is a local competitor to its Turkish peers. Unveiled in late 2017, its appearance subscribes to a familiar layout among armored trucks but its combat optimization is substantial. 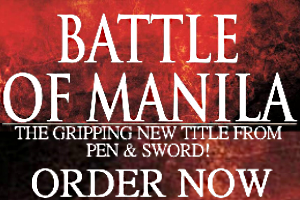 The promotional media released by its manufacturer shows it armed with an M2 Browning on a remote weapon station. The circular firing ports underneath its windows are distinctive as well. 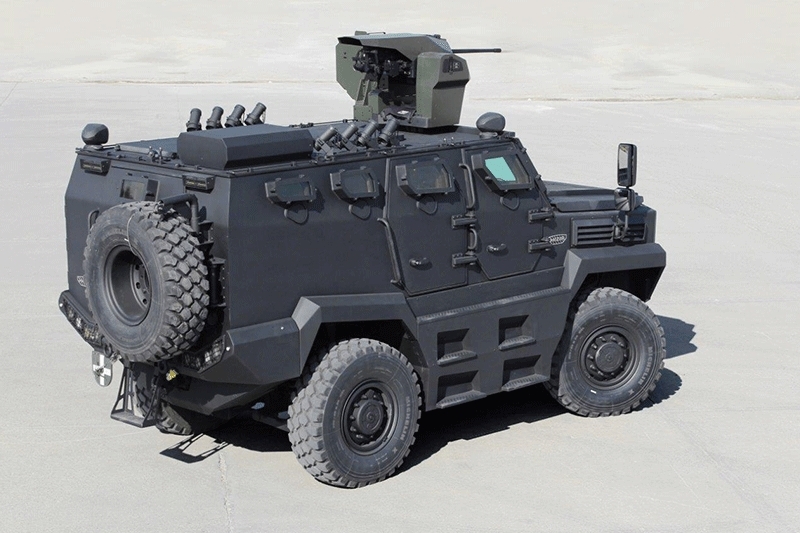 Like so many wheeled armored vehicles today, the Hizir is built on a Ford F550 chassis, albeit with a multitude of improvements on the final product. To tell it apart from other MRAPs, observe the enormous square grille and the four steps on either side of the hull. Along with the vertical handlebars next to the doors, the latter helps passengers to climb aboard. The 16 ton Hizir’s cab features a two panel bulletproof windshield and above it is an LED lamp for extra illumination. Another LED lamp is found at the back to illuminate the vehicle’s surroundings. The side doors have thick laminated viewing panels that complement the vehicle’s STANAG II armor level. Another countermeasure are smoke grenade dischargers sitting arranged in two rows along the edge of the roof. As mentioned, it’s possible to fight from inside the vehicle. Each Hizir fits a total of nine people, with seating for five available in the passenger compartment that’s accessible via a rear swing door next to a spare tire. When it comes to mobility, the pertinent details shared by the Hizir’s manufacturer reveal an Allison automatic transmission system, a 400 horsepower Cummins diesel engine, a top speed of 120 kilometers per hour, and a 700 km maximum range. Katmerciler offers features like a central tire inflation system, an air filtration system, a fire suppression system, GPS navigation, and even a towing winch upon request. The Hizir can be tailored for different roles on the battlefield, from an ambulance to a command vehicle and there are no environmental conditions–save for Arctic frost–that it can’t handle. This makes the Hizir an attractive prospect defense ministries looking to import mine-resistant vehicles rather than settle for US military surplus. But if the Hizir is too heavy, Katmerciler has another armored transport called the Khan based on a Toyota Land Cruiser. Like its heftier sibling, the Khan is offered in variants that include a “utility vehicle” with a pickup layout. 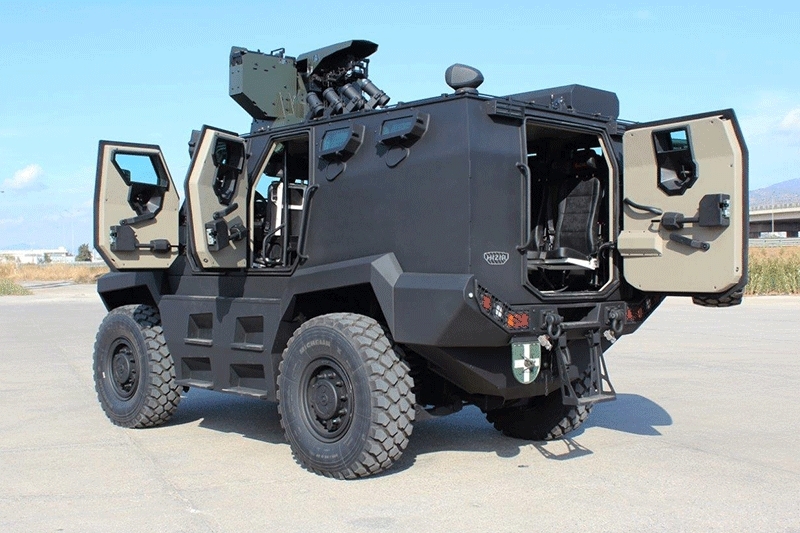 Both models have strong prospects in Africa, Central Asia, and the Middle East–regions where the threat of civil unrest and terrorism are fueling demand for wheeled armored transports able to resist enraged stonethrowers and the brute force of a roadside bomb. 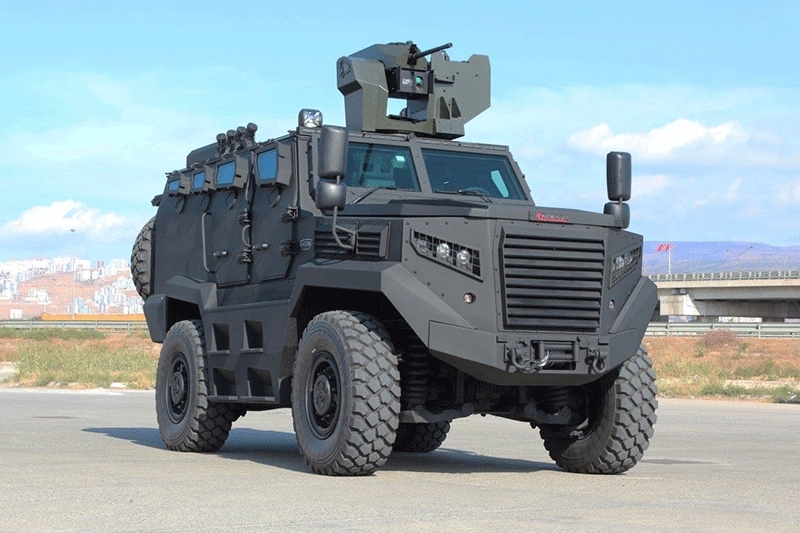 Turkey is an aggressive exporter of its military products anyway, so it isn’t far-fetched if large orders are placed for its mine-resistant vehicles.